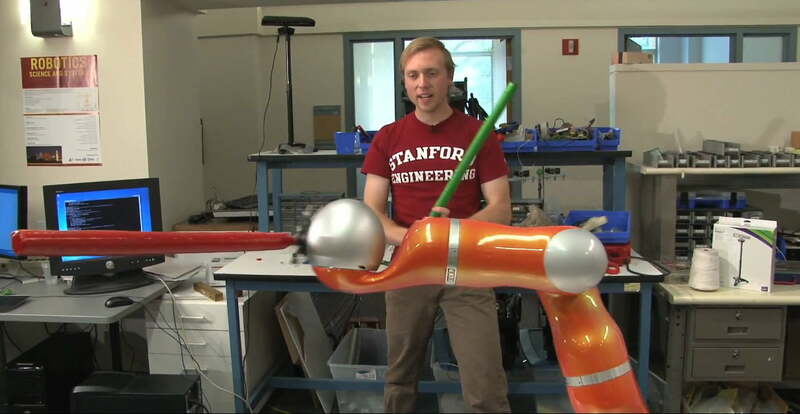 Designed for a class project in just under a month, the ‘Jedibot’ is a pre-fabricated, bright orange robotic arm that has been programmed to attack students with a red foam lightsaber. The robotic arm chooses a random attack and the student under attack defends with a green lightsaber. The arm has been set to only attack every two or three seconds, so the speed of attacks can easily be blocked. However, it’s likely that the speed can be increased as the defensive positioning occurs in real time based off the movements of the student. When the arm is put into defensive mode, the Microsoft Kinect starts watching the green lightsaber. The robotic arm reacts to the position of the green saber and moves to counter attacks. Assuming the student stays in the Kinect line-of-sight, the arm moves extremely fast and manages to block the majority of attacks. The color sensor in the Kinect isolates the color of the student lightsaber and is able to track the position of the swinging foam saber. If there were other green objects in the view of the Kinect, tracking wouldn’t work accurately. Beyond the lightsaber-swinging robot, another group built a robot to flip burgers on a hot grill. The robotic arm uses a sensor to understand when the spatula is touching the meat patty. Groups also taught robotic arms how to play golf, draw time-lapse LED artwork and take photos. Students demonstrated the different robotic projects as part of the final day of class in an Experimental Robotics course at Stanford. Microsoft announced a partnership with LucasArts at E3 2011 in designing a Kinect-controlled Star Wars title specifically focusing on lightsaber battles. The Xbox 360 title is called Kinect Star Wars; our hands-on E3 impressions. Perhaps the developer should hire these Stanford students to help out.